And so has more fabric!!! We have new batik basics, new collections, some amazing new digital panels from Hoffman – and so much more!!!! Stop by and see all our new goodies – you will love them. We have lots of themed bundles (autumn, Halloween, Christmas, etc.) that discounted, making them a really good buy. We also now have the Quilters Select Rulers now – available only in quilt shops, they are clear rulers that don't slip. So, come in and take advantage of our National Sewing Month specials - pick up some of those feet you have been wanting. Also new – our webpage! We have a new host for our web site, so we have re-built the pages. It is still a work in progress, and we ask that you please visit it, wander around, and give us feedback. If anything needs changed, or isn't working, or if you have suggestions – we would love to hear from you. Please let Amy or Michelle know about any problems you spot or anything you think we should do differently. It is www.hhqsewingcenter.com – and we would certainly welcome your ideas. Tuesday, September 12: Judy Bowers will have a Judy Niemeyer Sew Day. This is a time you can bring any problems you are having with any of your JN projects and get professional assistance. It will be from 11am until 4pm. Please call the shop to reserve your place. Wednesday, September 13: Michelle will be teaching another basic Free Motion Quilting with Rulers class. There are still two openings in the class, but enroll soon if you are interested. There is a project that needs to be prepared in advance, and we need to be sure we have the correct ruler foot and ruler on hand for you. Thursday, September 14: An Advanced Beginner class begins in the afternoon. This is a follow-on for our Beginning Machine Quilting class, and is meant for quilters who know the basics, but want to move further ahead. We will make a sampler quilt with 5 different blocks, and learn Flying Geese, curved piecing, sashing, cornerstones, setting triangles, and other techniques. Please see the website or call the shop for more details. It is a 5 week class, and there is some advance preparation before the class begins, so sign up soon! Friday, September 15: A Pre-Retreat Prep day for anyone taking part in the Fall Retreat. Judy Bowers will work with each person individually to help them audition the fabrics for their retreat projects. Tuesday, September 19: Embroidery Club will meet as usual. In addition to this month's project, they will be discussing future projects. This group is led by Barbara, a very experienced machine embroiderer, and the purpose of the club is to become more experienced with your embroidery machine as you work on a variety of projects. 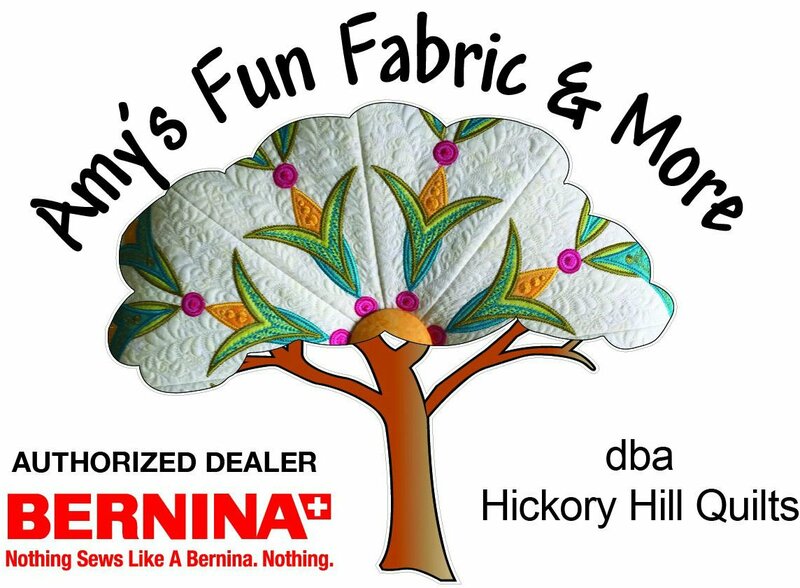 You do NOT have to own a Bernina embroidery machine to participate in this club – it is open to anyone wanting to improve their machine embroidery skills. It meets from 11-4. Call the shop to reserve your place. Thursday, September 28 – Saturday, September 30: Our Judy Neimeyer retreat. Judy Bowers, a Certified Instructor, will teach the retreat – the gorgeous Vintage Rose. We have the sample quilt in the shop – it is so beautiful! Participants can set up Wednesday, so that they are ready to begin work first thing Thursday morning. There are still openings – but you must be signed up by September 8th, and paid by the 12th to join this retreat. Many of you will remember the days of Stack 'n Whack – would you believe it, it is coming back around? And a lot of us are delighted because we didn't learn how to do it back in the day, and would love, love, love to try it now! Cheryl White, whom many of you will know from the Village Quilt Guild, has agreed to teach an beginner and an advanced class in this technique. We are delighted! Watch for it to go on our calendar soon. Amy and Barbara will be kicking off a professional embroidery business in the shop in the very near future. We just got a Bernina 16-needle embroidery machine (and we will be selling and servicing them, too), and it will be put to work. We are very excited about it!